I heard about your products and results from a friend (Jerome V.) who is taking your products and is in the body composition contest. I’ve read a lot about what you are doing, on your website. I’m very interested in participating in your contest(s). 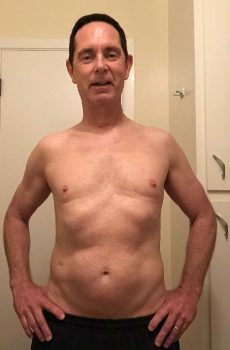 I am 60, with a long history of competitive swimming and water polo, followed by decades of typical gym activities/regimens. I actually played water polo for Team USA in the late 70s. I also lifted weights of course during my water polo career, but for decades after. Now, despite my efforts, I’m starting to look like the dreaded 60 year-old male with torso (belly) fat.